Callao Cave on Luzon Island, Philippines. Scientists are reporting the discovery of a previously unknown species of ancient human that lived in the Philippines over 50,000 years ago. Evidence suggests the new species, named Homo luzonensis, was exceptionally tiny—and possibly even smaller than the famous Hobbit species uncovered on the island of Flores in 2004. The story of human evolution just got a hell of a lot messier—and considerably more fascinating—owing to the discovery of a previously unknown human species. Bits of teeth and bone pulled from Callao Cave on the Philippine island of Luzon point to the existence of a distinctly human species, one deserving of the Homo designation in terms of its genus. At the same time, however, the fossils found in Callao Cave exhibit features unlike anything ever seen before, thus warranting the declaration of a completely new human species, Homo luzonensis. The details of this astonishing discovery were published today in Nature. Needless to say, this is a huge deal. New human species tend to not be discovered on a regular basis. The discovery of Homo luzonensis, with its curious set of physical characteristics, is telling us some surprising new things about human evolution and what happened to the pioneering hominins who left Africa so long ago. This story begins in 2010 with the important discovery of a single human foot bone, dated at 67,000 years old, in Callao Cave. The exact species could not be determined, but it was the first direct evidence of a human presence in the Philippines. As an important aside, we’ve since learned that hominins—the sub-group of primates that are more closely related to us than to chimpanzees and bonobos—were living in the Philippines as long as 709,000 years ago. A butchered animal bone found a the Kalinga site in Luzon, Philippines, showed hominins were active on the island as far back as 709,000 years ago. The newly discovered species, called Homo luzonensis, lived in the Philippines around 67,000 years ago. It’s not known if the two groups were related. Indeed, the story of human evolution is getting increasingly complicated. Hominins first appeared in Africa some 6 to 7 million years ago, with the first evidence of a hominid presence in Eurasia dating back about 1.8 million years ago, likely the archaic human known as Homo erectus. Incredibly, this dispersal happened long before our species, Homo sapiens, emerged; we finally entered onto the scene 300,000 years ago, spilling into Eurasia about 100,000 years later. There, we joined two other human species, the Neanderthals and Denisovans. 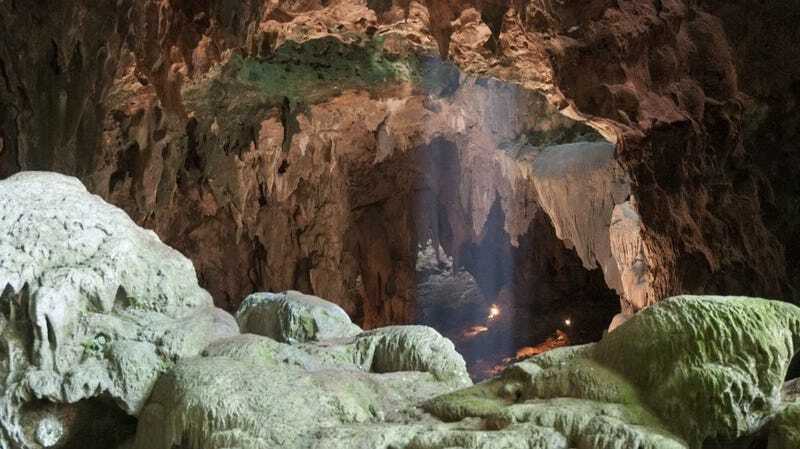 The scientists who found the human foot bone in the Philippines, a team led by Florent Détroit from the National Museum of Natural History in France and Armand Mijares from the University of the Philippines, kept working at Callao Cave in an effort to find more clues. These ongoing excavations resulted in the discovery of 12 new hominin elements, including teeth, a partial thigh bone, and several hand and foot bones. These fossils belonged to three different individuals, two adults and one child. No genetic evidence could be extracted from the specimens, and sadly, no skulls were found. These remains were pulled from the same stratigraphic layer as the foot bone found in 2010, dating these individuals to the same time period. The Hobbits and H. luzonensis bear striking similarities, and they were around at roughly the same time, but their evolutionary relationship is not known. It’s conceivable that both human species are descendents of H. erectus, and that both ended up isolated on their respective islands. In terms of the distinct physical differences observed in H. luzonensis, the most notable were seen in their teeth and foot bones. Their molars, in particular, were unlike anything ever seen before in a human species. Writing in an accompanying News & Views article, anthropologist Matthew Tocheri from Lakehead University in Thunderbay, Ontario, described how their teeth exhibited both ancient and modern features. The third metatarsal—the long bone in the middle toe—in H. luzonensis is exceptionally strange, bearing an uncanny resemblance to those seen in Australopithecus—an ancient human ancestor that lived in Africa some 3 million years ago and never left Africa. Well, at least to the best of our knowledge. H. luzonensis also featured hand bones similar to those of Australopithecus. Crazy theory number one: Conventional thinking has it that Homo erectus was the only hominin species to have left Africa during the Early Pleistocene, the period between 2.58 to 0.78 million years ago. The evidence found in Callao Cave would seem to suggest that we’ve got it all wrong, and that other hominins, including groups more closely related to Australopithecus (or even Australopithecus itself! ), made their way into Eurasia during this period. More evidence is needed to back this extraordinary possibility. Crazy theory number two: An intriguing aspect about the H. Luzonensis third metatarsal is that it allows for more curved toes. This is significant because curved toes are great for tree climbing and hanging from branches. Australopithecus, a suspected tree climber, was equipped with this particular physical feature, and it would seem to suggest the same for H. luzonensis. But if H. Luzonensis is not closely related to Australopithecus, then why the curved toes and hands? It’s possible that some hominins retained their tree-climbing abilities for much longer than is conventionally appreciated. Another possibility is convergent evolution, in which similar physical characteristics appear in unrelated species. Should this be the case, if would mean that, after thousands of years of upright, bipedal locomotion, H. Luzonensis was returning to an arboreal existence, and evolving the requisite physical characteristics. It’s a mind-blowing theory, no doubt, but again, one in desperate need of further evidence. Paleontologist Adam Brunn, a researcher at Griffith University and an expert in the hominin colonization of southeast Asia, had been hearing rumours about the Luzon fossils for years, saying it’s “brilliant” to finally seeing the new findings published. Gerrit van den Bergh, a senior lecturer at the University of Wollongong’s Centre for Archaeological Science, said the researchers were “justified” in their decision to name the new species. He said it’s fascinating that Luzon is now the second known island, after Flores, in which a distinct human species existed before the arrival of H. sapiens. Anthropologist Dean Falk from Florida State University had few quibbles with the new paper, but the one issue she did raise was beyond the control of the researchers: their inability to find a skull. Despite this major limitation, she “became convinced that the authors have identified hominins with unique dental features combined with at least some features of hands and feet that resemble Australopithecus,” adding that these “specimens may, indeed, represent a previously unidentified species,” wrote Falk in an email to Gizmodo. Ultimately, however, the story of human evolution just got a lot more “bushier,” she said.